Mike ran a wonderful, lively session for Westminster Primary Music Co-ordinators at their Network Meeting. The session was interactive and great fun for all concerned, and evaluation forms were enthusiastic about how very useful the session was. He taught the group various rhymes and chants, played his guitar and sang songs, many of which are from his excellent publication The Tommy Tomato Songbook. Mike has a marvellous rapport with teachers and knows how to put them at their ease, presenting his materials in an interesting, non-threatening but totally irresistible way. Mike is one of these inspirational people you meet from time to time who is able to convey his passionate belief in the power of music and singing in particular, in raising children's self esteem. Mike began his career as a Drama and English teacher in 1976 at Islington Green School, London. In 1995 he became the Music and Performing Arts Co-ordinator at an all-age MLD school in Enfield, Middlesex. He was there for seven years, eventually becoming Head of the Secondary Department. During that time he taught music across the key stages, bringing in his own compositions to meet the needs of the children. 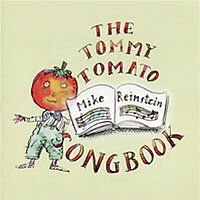 Some of the songs that Mike and his wife Reina wrote for the school were eventually gathered together as The Tommy Tomato Songbook CD , originally published by Sheffield Hallam University Publications in 2005. The CD met with considerable critical acclaim and the songs have become favourites with children and teachers wherever they are sung. Following the success of the CD, Mike facilitated singing workshops with teachers in Barnet, Enfield, Westminster and West Sussex and with childminders in Stafford. In July 2007 he led a workshop at the Singposium at the Birmingham Repertory Theatre organised by the Music Education Council and Music for Youth. He has also published articles about his practice in Early Years Educator, 5-7 Educator, Special Children, Education for Everybody and SEN. In 2001 Mike left teaching to work for the NHS as a dramatherapist with adults experiencing mental health problems. However, he continued to take singing sessions for one day a week in special and mainstream infant schools across Enfield, Middlesex. In 2006 he moved to Sussex and returned to teaching. Mike is now a part-time teacher of music in Balfour Primary School, Brighton and leads song writing sessions in Westdene Primary School, also in Brighton. Mike has written an article on his experiences making music with special needs children - read it here. In July 2011 he wrote an article for the magazine 5-7 Educator about the process of writing songs for children - read it here.